Jason Crane interviews pianist Jason Moran at the 2007 Rochester International Jazz Festival. Moran came to play with two bands — his own Bandwagon and Don Byron’s Ivey Divey trio. 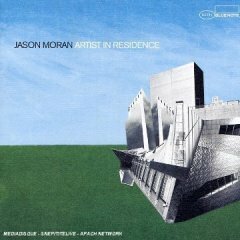 Moran’s most recent CD is Artist In Residence (Blue Note, 2006), an album composed mostly of Moran’s commissioned works. Moran talks about philosopher Adrian Piper, pianist Jaki Byard, and his new commission to create a multimedia piece inspired by Thelonious Monk’s 1959 Town Hall concert. Find out more at JasonMoran.com.